Every once in a great while, a gem of a game comes along and reminds us why we fell in love with a particular genre in the first place. Octopath Traveler, the latest Japanese RPG from renowned publisher Square-Enix, has been just that for me. Full disclosure here: leading up to the retro JRPG’s release, I had admittedly little interest in trying it. I’d played numerous games that were similar before, both present and past, and had my mind fairly set on skipping this one. Not because I didn’t believe that I would enjoy the game that harkens back to arguably the greatest entry in the Final Fantasy franchise (VI, not VII, as many a fanboy would cry); quite the contrary in fact. With the tidal wave of titles on the way in the coming months, I had resigned myself to dedicate time elsewhere. But when a dear friend of mine picked it up and sung its praises from the mountaintops, I decided to give the retro role-playing game the once over. Thank heavens I did. Octopath Traveler is not unique; in fact, there are a great many games out there that could satisfy one’s itch for a JRPG with a retro flair, both aesthetically and in game-play. Each character’s individual story and how it contributes to the overall narrative is nothing truly unique. The Cleric, Ophelia, is an adopted young woman who was taken in by the Church of the Sacred Flame after her parents were murdered, and she takes the place of her adoptive sister on a holy pilgrimage when their father falls ill. The Scholar character, Cyrus, is a professor at the grand and prestigious Royal Academy in Atlasdam, and after solving the mystery of some stolen ancient tomes, he is wrongfully accused of soliciting an inappropriate relationship with the crown princess and subsequently kicked out of the academy indefinitely. These are all fairly generic character tropes and archetypes that we’ve seen before in no shortage of fantasy RPG games. But the game has charm. The battle system in Octopath Traveler is a delicious parfait of classic, turn-based JRPG mechanics and a boosting system similar to that of Bravely Default (also from Square-Enix). When a given party member has built up enough Boost Points, or BP, with a quick tap of the right bumper they can increase the power of their impending attack by up to three levels, indicated by a Dragon Ball-esque aura burning around said party member. 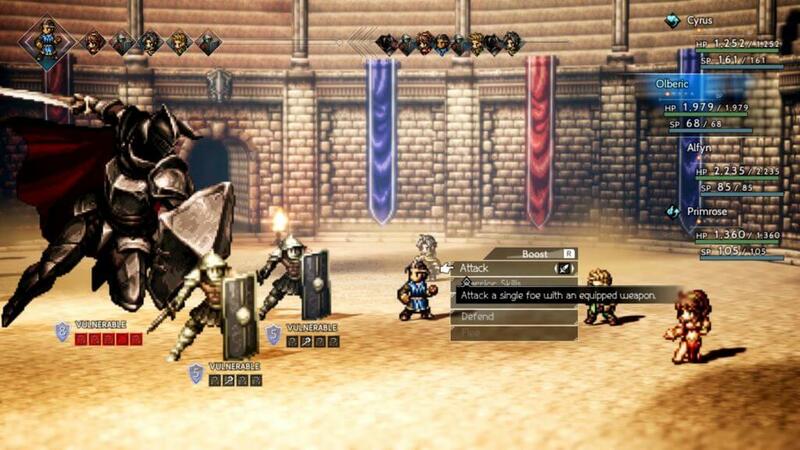 Additionally, players can reduce their enemy’s Shield Points by targeting their weakness, be that a specific type of elemental damage or weakness to a certain weapon type such as staves or bows. Doing so causes a “Break” effect in which the opponent becomes temporarily disabled and additional damage can then be inflicted as a result. 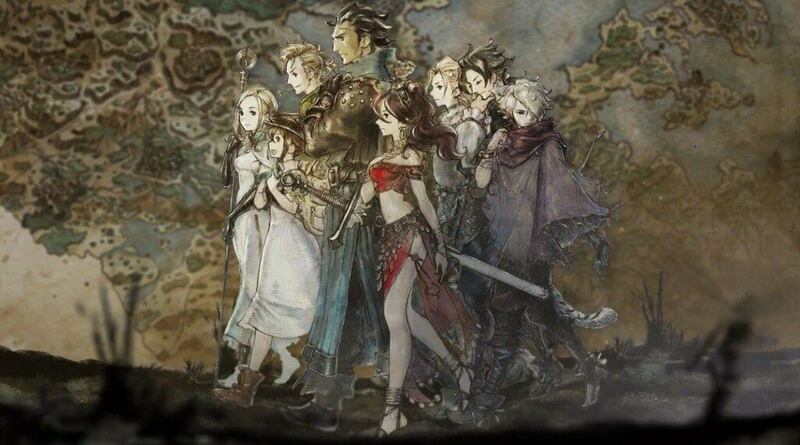 Octopath Traveler offers a large party of characters for you to seek out and convince to join in your quest, each with their own unique class. Many familiar with fantasy RPG games will recognize the archetypes right away: Cleric, Scholar, Merchant, Warrior, Dancer, Thief, Apothecary, and Huntress. Each class bears its own unique weapons and Path Actions – abilities that are specific to that class and can help you overcome many obstacles. For example, I chose to start my journey as the Scholar who utilizes staves and various elemental spells to deal damage. His class Path Action is called “Scrutinize,” wherein he can interrogate the many inhabitants of the realm to glean important information regarding the main quest, side quests, or learn the location of hundreds of hidden items scattered around towns. Successful scrutiny of an NPC would reward me with the aforementioned treasures, while failure to do so too many times would cause a rift between and the folk of that particular town or city and rend me unable to use my ability there. This tarnished reputation can be repaired by the respective town’s bartender – for a price (and a darned steep one at that). Suffice to say, overuse of this particular ability should be cautioned. Beyond Path Actions, each class also possesses a special “Talent” unique to them. To use my primary character as the example: when an encounter first begins, the words “Study Foe” flash at the top of the battle screen, and a single weakness (most foes have several) for each enemy present in that battle is revealed. Throughout your travels, you can also come across various shrines that bestow secondary job classes to your party. Any character may use these secondary classes, provided it is not one that they already are; however, a given job may be used by only one character at a time, and you must swap your job class if you wish to set that one to another party member. As you participate in battles, assuming you’re successful, you earn Job Points (JP) for each character, which are used to learn new skills. The cost to gain a subsequent ability increases each time (exponentially so, actually, and I was caught off-guard by the steep inflation when I purchased my first new skill). While you earn JP with every battle won, the amount, regardless of performance bonuses, is quite abysmal once you’ve purchased a few skills already, so the game very much makes you dutifully consider long and hard which skills you choose to learn first. This is one of a few mechanics to the game that add a passive difficulty curve, in that if you don’t spend your JP wisely early on, you may find yourself struggling immensely against random encounter foes not too far into your adventure. And that leads into the world itself, which is fairly large for a game of its type, and thankfully you can fast-travel to any town or city you’ve already visited in most cases. 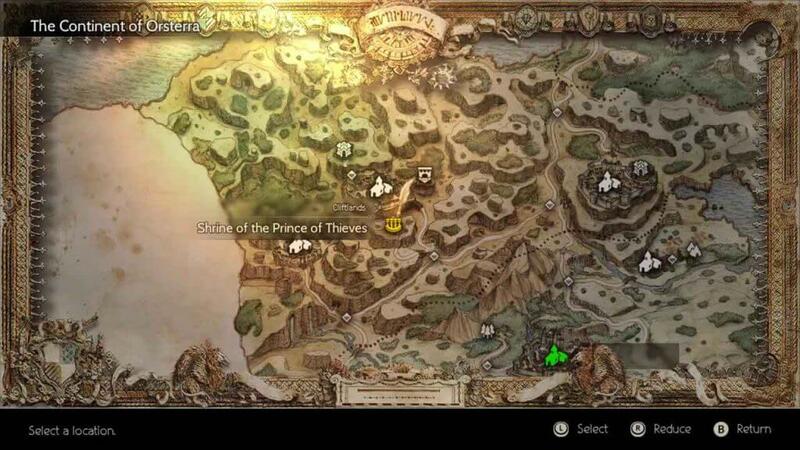 For the sake of transparency, I did find the world map of Orsterra to be frustrating to navigate at times, and I often found myself in an area with enemies far beyond what I could feasibly defeat and was left thankful that the game is relatively generous with the scattering of save point altars. Recruiting the various other characters is straightforward enough: upon reaching the town or village that serves as the starting point for that particular character, you must first find them and then play through the opening chapter of their story (or a portion of it – you are able to face their beginning bosses with whomever your current party has in tow as well). Upon completing the beginning of their own adventure, that character then joins you along in yours. You must simply rinse and repeat this process as you come across each location that bears a new character. For instance, I took Cyrus from his starting city of Atlasdam to the home of the game’s Cleric class, Ophelia, Flamesgrace – knowing full well that no RPG party is complete without a healer. From the wintry village of Flamesgrace, I then made my way south (far south), back beyond Atlasdam and the proceeding harbor and coastal areas, en route to my next party member of choice. The game is relentlessly unforgiving of trespassing into regions that are high in “Danger Level” proportionate to your party members, and I do not use that as an exaggeration; when I stumbled into a region that I shouldn’t have been in, the game was swift to let me know that I was still a low-level jabroni and had no business there. Square-Enix’s latest foray into the classic JRPG format delivers in spades, and where the game slips, other areas make up the difference and then some. The game is a visual masterpiece for its class. Everything about it screams Final Fantasy VI and Chrono Trigger throwbacks. The pixelated characters retain the charm of those from days gone by, and the soundtrack feels right at home in the world they’ve created. Elements of the game’s visuals that wouldn’t suffer from modernization were given a gorgeous brush stroke. Bodies of water and elemental effects from the various spells are rendered beautifully and at once stand out from the world, in that they catch you by surprise while maintaining a visual balance that doesn’t feel out of place. Apart from the game’s map, and the shortage of currency and Job Points in the game’s front half, Octopath Traveler gives precious little to complain about. It is indeed a throwback masterpiece and reminds me of why I fell so deeply in love with the JRPG genre in the first place with its finely-tuned combat and colorful cast; the game is undeniably addicting. It’s no wonder that it’s nigh impossible to find on store shelves. Square-Enix continues to prove that their history is where their talents lie. With a wonderful combination of retro style and visuals, elegant soundtrack, and large cast, Octopath Traveler is the premier JRPG for the Nintendo Switch console.